Whether you’re bringing work home, doing homework, or compiling the family books, a home office provides a convenient place to get work done. With the right solution, this space can blend effortlessly into your home, even doing double-duty as an office or media center. Here are a few tips to help a single small space perform admirably whether you’re on or off the clock. Paper, notebooks, and pens may be necessary for your work, but they don’t have to stay out in the open. Conceal them behind storage doors and drawers when not in use so your home always looks tidy and neat. If your office is sharing space with other living areas, look for ways to blur the boundaries so they can coexist peacefully. Using open shelves to show off personal mementoes can help this type of space feel connected to the rest of your home. Opt for a design that uses support feet to raise cabinets off the floor, creating a contemporary, residential feeling. Consider all of the items you bring into your home office, and plan storage space for each of them. 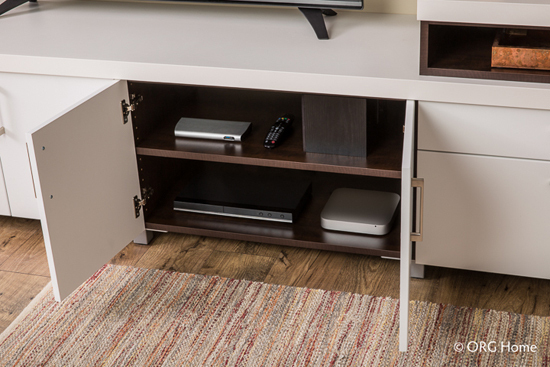 Then stash your briefcase, remotes, or technical equipment in a cubby instead of leaving them out in the open. A well-lit surface makes every task easier, but there’s not always room for a separate task light. Instead, mount low-profile LED strips beneath upper cabinets to illuminate the work surface when the area is in use. 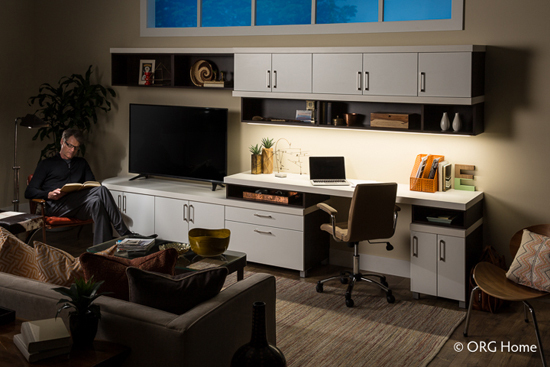 Don’t let your home office or entertainment options be limited by small spaces. Good design can make the most of any space, letting you experience the best of both worlds.